Alkyl(hetero)aromatic α-hydroxyamino oximes with the anti configuration of the oxime group reacted with ethyl glyoxylate to form 5-aryl(hetaryl)-1-hydroxy-1H-imidazole-2-carboxylic acid ethyl esters. In the case of 4-fluorophenyl-, 4-chlorophenyl-, and 4-methoxyphenyl-substituted α-hydroxyamino oximes, 3-aryl-5-hydroxy-5,6-dihydro-4H-1,2,5-oxadiazine-6-carboxylic acid ethyl esters were also formed. The positions of the substituents in the imidazole ring were established on the basis of a comparative analysis of the spectroscopic data of these products and the synthesized isomeric compound, 1-hydroxy-5-methyl-4-phenyl-1H-imidazole-2-carboxylic acid ethyl ester. 5-Aryl(hetaryl)-1H-imidazole-2-carboxylic acids were obtained in the reaction of 5-aryl(hetaryl)-1-hydroxy-1H-imidazole-2-carboxylic acids ethyl esters with chloroacetone. The authors are grateful to the Chemical Service Center for Collective Use of the Siberian Branch of the Russian Academy of Sciences for conducting spectral and analytical studies. 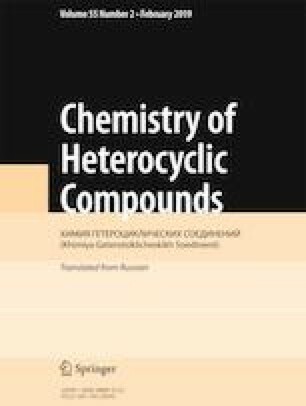 The authors are indebted to V. M. Mamatyuk (N. N. Vorozhtsov Institute of Organic Chemistry of the Siberian Branch of the Russian academy of Sciences) for his help in recording and discussing the 13C NMR spectra of imidazoles and Candidate of Chemical Sciences S. A. Amitina for participation in carrying out the synthetic experiments.